Antiquities have for centuries held historical importance to the cultures and places from which they originate. These ancient objects have enriched cultures all over the world. Textbooks and even movies have taught about the Seven Wonders of the World, King Tutankhamen, the Mona Lisa, and thousands upon thousands of other antiquities that resonate with people of every culture. Ancient objects confirm historical events and teach the global community about ancient societies. Culturally they are important for humans also teaching us to be well rounded and not ignorant of the beliefs and cultures of others. Because of its vast archeological sites, and more than 5000 years of recorded history, Egypt has produced many of the world’s most sought after antiquities, and Egypt’s calls for the return of some of these objects have sparked controversy. The difference of opinion as to whom the ownership of antiquity belongs is an age-old argument. The central debate is this: should antiquities be repatriated and the modern nations be given ownership of them or is it better for these objects to be owned by and housed in encyclopedic museums for the cultural betterment of those who can learn from them there? Chas. Chaillé Long, the author of “Send Back the Obelisk”, strongly believed that the obelisk, Cleopatra’s Needle, should be returned to Alexandria where it was built and resided until 1877. He saw the original beauty of it as “…it stood at the door of the great Temple of the Sun at Heliopolis” (Long 2). There is where it had the most meaning to him, not in the Metropolitan Museum of Art in New York City, 5,000 miles away from its homeland. Many have long believed that the obelisk was “…rudely torn from its native shore” (Long 3), but the truth of the matter was that the location of the obelisk would soon to be overtaken by the sea, where the obelisk would be worn down and most likely knocked over. The other side of the debate is that antiquities are better served in encyclopedic museums. John Cuno defends encyclopedic museums in his article “Culture War” and explains how they are beneficial. “By preserving and presenting examples of the world’s cultures, they [museums] offer their visitors the world in all its rich diversity. And in doing so, they protect and advance the idea of openness and integration in a changing world” (Cuno 5). Antiquities should be housed in encyclopedic museums allowing audiences to experience cultures they may never have the chance to otherwise, and offering better protection of these important ancient objects from looters and those who would engage in the illicit trade of antiquities. Many modern nations are claiming the right of ownership of antiquities from their region such as Egypt’s claim to many objects of the Pharoaic Era as well as Iran with ancient Persia, and Italy with the Roman Empire. The UNESCO convention of 1970 is not a law in itself, but it is a binding agreement meant to prevent looting and illicit trade of antiquities (Cuno 7). This shouldn’t give these modern states the right to claim ownership of ancient objects that are being well preserved, and securely housed in an encyclopedic museum. These museums effectively protect these important historical treasures from looters and those who would destroy them – protection that the countries of origin do not provide in many cases, and more frequently than ever. Modern culture is much different than ancient cultures, and modern nations should not be able to make claims on historical objects for political reasons. In some cases the habitat and land surrounding an antiquity is changing and can effect the object, like that of the previously mentioned Cleopatra’s Needle, which was removed from its original location because “… the sea was encroaching upon the land, and if not taken down it was destined to topple into the sea” (Long 4). Cultural institutions, like encyclopedic museums serve the global community by promoting “…pluralism, diversity, and the idea that culture shouldn’t stop at borders-and nor, for that matter, should the cosmopolitan ideals represented by encyclopedic museums” (Cuno 3). This does not mean that encyclopedic museums can overlook or ignore claims of cultural ownership. On the contrary, they should be sensitive to claims of cultural ownership. There should be a sense of integrity as to how the artifacts were obtained or purchased, and museums should seek to authenticate by any means possible the validity of the source from which the antiquity is originating. Encyclopedic museums best serve the people who live in and visit cities where the museums are located. The audience does not have the right to materials from other nation states, but the global community should be able to experience these objects. There should be a commitment to cooperation between governments and museums to build more museums all over the world, and to share the most important ancient artifacts so people can be educated, and aware of other cultures and their history. The audience does not have a greater right than the citizens of modern nations, but perhaps there is a way to share these objects with museums in a spirit of cultural education for the global good. One audience is not privileged over another; everyone has the equal right to visit encyclopedic museums all over the world. A balance can be struck between a global sense of history and heritage and the demands and issues of modern nation states by expecting both modern nation states and encyclopedic museums to see the intrinsic value of these antiquities as well as the benefits that come from humanity being able to enjoy these objects. “For encyclopedic museums to fulfill their promise of cultural exchange, they should be established everywhere in the world where they do not now exist. And existing encyclopedic museums should aid in their development” (Cuno 11). Encyclopedic museums encourage education in history and diversity all over the world. 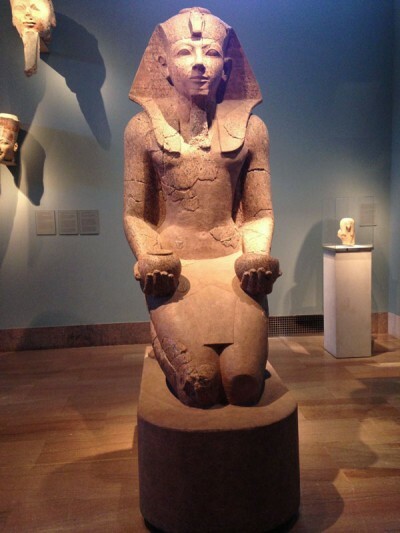 Although the original location of an artifact is important, there are cases when an artifact may be better suited and better protected in a museum. Government instability, environmental issues, and looting are all contributing factors that should be considered when deciding where certain antiquities should be housed. Encyclopedic museums of good repute should take seriously the responsibility to aid in and encourage the establishment of museums all over the world, “… to fulfill their promise of cultural exchange” (Cuno 128).